The University Libraries' Research Data Services program presents worksops on one Friday of each month that focus on tools and strategies that make data management, analysis, visualization, communication, and sharing more efficient and more fun. Each workshop will begin with an introduction to the topic followed by an open lab to experiment with what was taught. 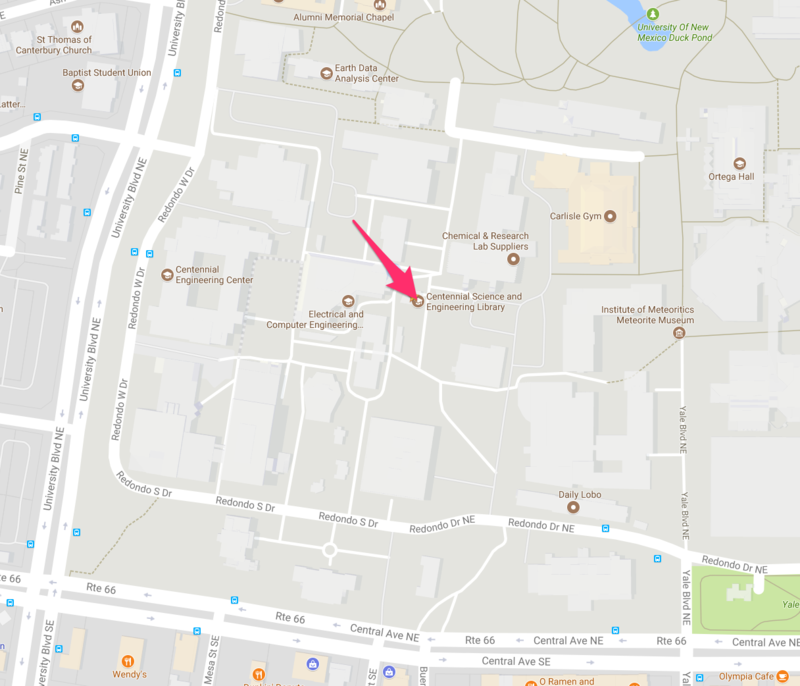 Where is the Centennial Science and Engineering Library? The Centennial Science and Engineering library is located in the SW quadrant of the main UNM campus. We encourage experimentation with the tools and technologies that we cover in the workshops. To make this easy we have created an installer of all of the developed workshop content and applications that you can run in a self-contained environment on our own computer. Installation and setup instructions can be found in our github repository at: https://github.com/unmrds/cc-content-platform. UNM students, staff and faculty can check out a laptop computer from the library to use during the session and everybody is encouraged to bring their own laptop computer to practice on. You can contact Karl Benedict at kbene@unm.edu or Jon Wheeler at jwheel01@unm.edu for answers to any of your questions about the workshops.